" Where the hell are you taking me?!" Draco said when they had disapparated from the Malfoy manor. " And what did you talk to my dad about?!" " Oouw, someone is jealous" Hermione teased and winked. " Don&apos;t even go there" He said harshly. " So you are the jealous type?" Hermione said while she opened the door and stepped inside. Draco tried to hide a weak smile. " If you only knew"
She let Draco in and noticed that the house stood empty. She guessed that Ron had something to eat before he met Harry. " Are we alone?" She heard Draco&apos;s voice in the dark.
" Looks like it. Why? Afraid of the darkness?" She was in a teasing mood tonight. But Draco just chuckled. " I think it&apos;s you, who should be afraid of the darkness. Especially when I&apos;m in it"
" Pfft!" She snorted. " Why should I be afraid of you? I&apos;ve never been it before, so why should I be now?" " Because I&apos;m not the same guy as before. I&apos;m a death eater"
" You&apos;re a former death eater, Draco" she corrected. " It&apos;s not the same thing"
" Good, then expect that you&apos;re not afraid of me when I do this.." Suddenly he pushed her carefully against the wall and didn&apos;t give her any chance to escape.
" Um...I don&apos;t think we have the same defination of what afraid is. I mean...diffrent things scares us" She tried to talk her way out of it, but deep inside she knew that wouldn&apos;t work. Maybe with Harry and Ron, but not with Draco.
" But you said you weren&apos;t afraid of me. Did you lie to me?" " No. No, I didn&apos;t " She tried to sound convincing, but she was slowly freaking out. He was scaring her now. It was only them, in the dark.
" Good girl. I&apos;m not scaring you when I do this...." His hand slowly caressed her chin, he leaned against her neck, and let his hot breaths meet her skin.
" Right" Hermione tried to sound strong, but her knees was starting to get weaker. This couldn&apos;t just happen!
" Seriously Draco stop doing this!" 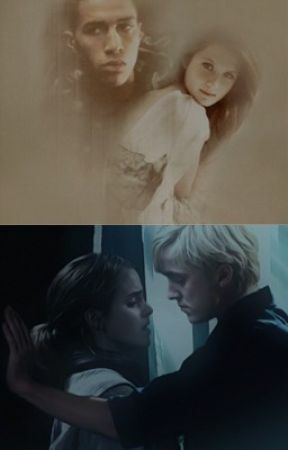 She hissed, but Draco was holding her in a steady grip. " Doing what? Scaring you?" " Try to take control over me!" " Well you don&apos;t seem to mind. You haven&apos;t struggled yet"
" You&apos;re holding me in an very steady grip. What are you? Iron-man?" " Relax Hermione. You&apos;re with me now, as long as you are, nothing will happen to you"
" There&apos;s nothing to protect me from!" " Except the darkness right?" She just looked at him, it was like he had read her mind. " I-I didn&apos;t say..."
" But you don&apos;t like the darkness right? " " I&apos;m not very fond of it. But can you let go?!" " No, I won&apos;t do that anymore"
" I won&apos;t let you go anymore Hermione. I&apos;ve done that for so long now. Too long"
" I want you now" He said pressed her harder to the ice cold wall.
" What do you mean?" She said nervously.
" I mean..." His lips was millimeters away from hers now. " ...that I&apos;m going to kiss you now. Wether you want it or not "
Hermione swallowed and looked deep into his grey eyes. She was so lost in his eyes. Suddenly she could feel her head nod to him.
" Kiss me then "